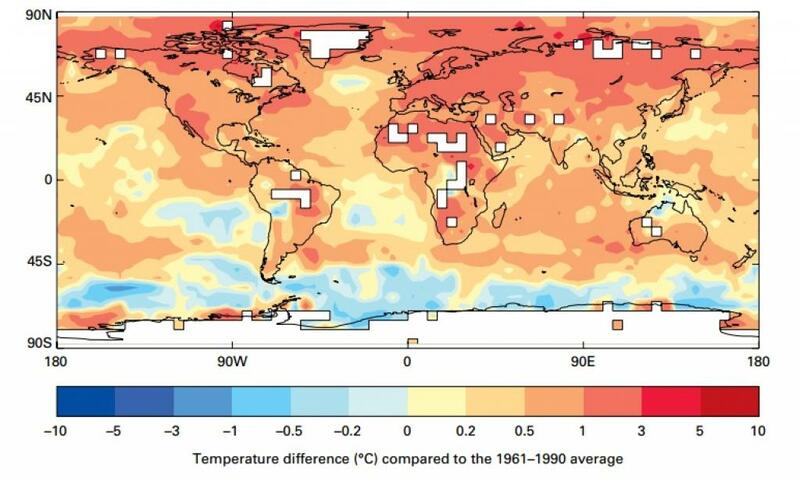 The period from 2011 to 2015 has been the warmest five-year period on record globally. The average temperature in 2015 had already risen by more than one degree (with 2016 on track to be even warmer) since the pre-industrial period. While there’s a growing fear that 2015's record-breaking temperatures will be normal by 2030, this year has already seen record-breaking heat for nine consecutive months. 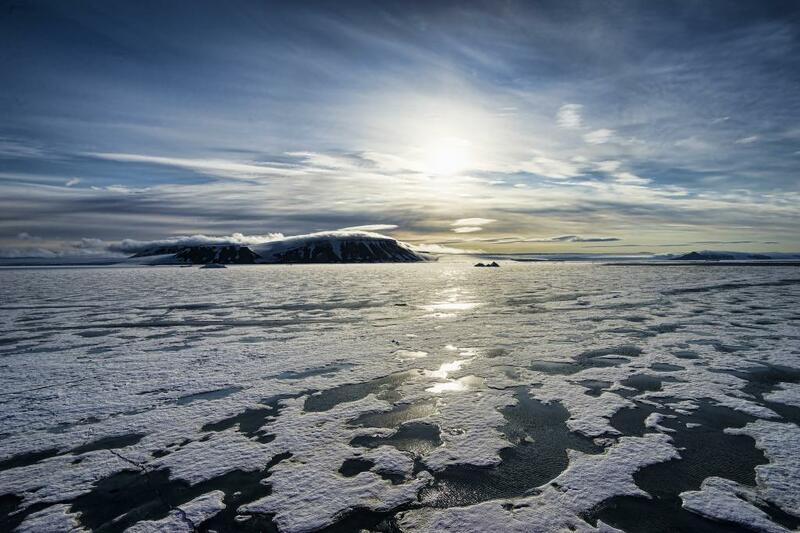 The early effects of climate change have been consistently visible in the form of increased global temperature—both over land and deep ocean—sea-level rise and the widespread melting of Arctic ice. A study by the World Meteorological Organization analyses this five-year period for a better understanding of multi-year warming trends and extreme events. According to the study, the period 2011–2015 began with a strong La Nina event and ended with a strong El Nino. The high temperatures in 2015 were influenced by the El Nino event that developed during that year but the primary impact of the 2015–2016 El Nino on annual global temperatures was felt in 2016. Many of the worst disasters between 2011 and 2015 involved extreme weather and climate. 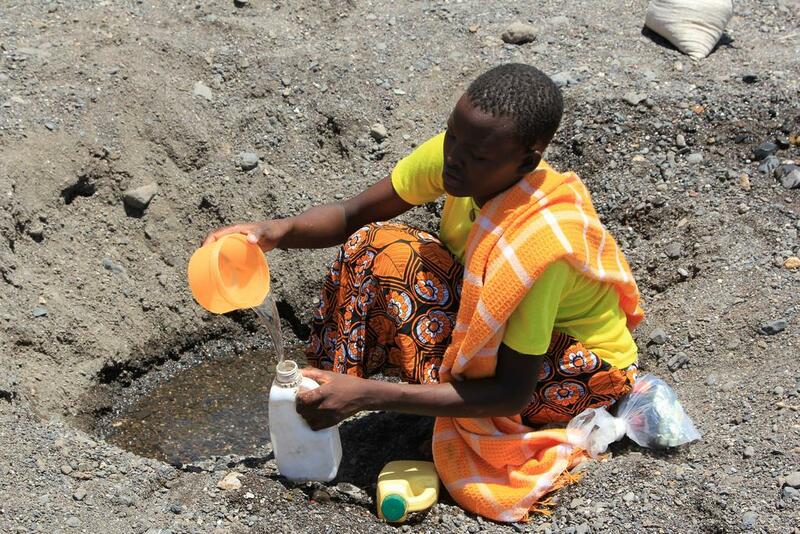 For instance, the drought in 2010-11 led to the famine in the Horn of Africa, which caused more than 250,000 deaths. Besides drought, heat waves and tropical cyclones in South Asia and hurricanes in the US caused huge casualty. In the midst of all this, the study revealed that the concentration of major long-lived greenhouse gases in the atmosphere continued to increase during the period 2011–2015. As global leaders deliberate on the modalities of Paris Agreement at COP22 taking place in Marrakech, the ulterior objective of limiting the global temperature rise to 1.5°C above pre-industrial levels will guide every decision. The findings of the study will compel the policymakers to reflect on changing climate conditions and strengthen the implementation of the climate deal. While 2016 saw the possibility of ice-free Arctic, sea ice started to witness decline in the period 2011–2015. 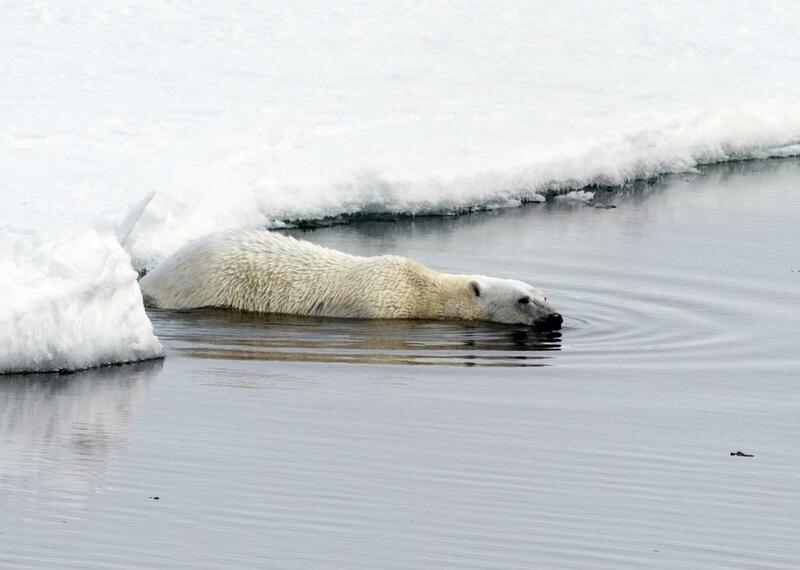 According to the study, the minimum summer sea-ice extent of 3.39 million sq km in 2012 was the lowest on record. The mean Arctic sea-ice extent in September (2011–2015), considered the month with the smallest sea-ice extent, was 4.70 million sq km. It was 28 per cent below the 1981–2010 average and also much lower than the previous lowest five-year average of 5.04 million sq km in 2006–2010. Although the Arctic Sea ice has not declined as rapidly in winter as it has in summer, the lowest extent (14.54 million sq km) of ice on winter was recorded in 2015. The five-year period also saw summer surface melting of the Greenland ice sheet at above-average levels. In fact, the summer melting exceeded the 1981–2010 average in all five years from 2011 to 2015. Apart from record low sea-ice extent, 2012 also experienced the most extensive Greenland surface melting of any year in the satellite record—about 90 per cent of the ice sheet. Between May-June 2012, earlier-than-normal melting of the snow cover in Arctic and sub-Arctic regions of Siberia, Canada and Alaska was recorded. The concern over sea-level rise also became graver during this period. Ocean warming results in both global and regional sea-level rise. According to the WMO report, rise in ocean temperature leads to about 40 per cent of the observed global sea-level increase over the past 60 years. The global warming has been felt so seriously that it halted 1,800 years of ocean cooling process. In early 2011, the global sea level was about 10 mm below the long-term trend value, primarily because of the strong La Nina phenomenon and high rainfall over land areas like Australia, resulting in above-normal water storage on land. However, the sea levels rose higher as the La Niña ended and had returned to above the normal trend by mid-2012. With the arrival of El Niño in early 2015, there was a marked rise is sea level by about 10 mm above trend through the second half of 2015. The departures from the normal trend, as observed in the 2010–2011 and 2015, were larger than anything experienced between 1993 and 2009. 2015, although the north-east remained dry. Meanwhile, large parts of the Amazon basin, centred on Brazil but also extending into neighbouring countries, were extremely dry in the southern hemisphere winter and spring in both 2014 and 2015, especially the latter; for example, rainfall at Manaus for June–October 2015 was 58% below normal. The dry conditions, which were accompanied by temperatures generally 2 °C to 3 °C above normal, contributed to very high fire activity, with the number of fires in Amazonas state in 2015 at record levels. The drought in the São Paulo region placed great stress on local water resources, with levels in local water storages falling to below 10% during the 2014/2015 summer, and resultant severe restrictions on water supply. The United States and adjacent areas of northern Mexico also experienced significant drought over large areas in the period 2011–2015. Texas and northern Mexico underwent a severe drought year in 2011, with drought conditions spreading to cover much of the central United States during 2012 and 2013. In July 2012, 64.5% of the continental United States was classified as being in drought, the largest extent since the Dust Bowl years of the 1930s. Total economic losses due to drought in the United States between 2011 and 2014 were estimated by NOAA NCEI at approximately US$ 60 billion. Parts of southern Africa were also affected by drought from late 2013, particularly Namibia, Angola and the North West province of South Africa in the 2013/2014 wet season, and much of South Africa from mid-2014 onward. The period from July 2014 to June 2015 was the driest on record for the province of KwaZuluNatal, and the fifth-driest for South Africa as a whole, while the 2015 calendar year was the driest on record for South Africa. Indian monsoon season (June–September) rainfall was more than 10% below normal in both 2014 and 2015. A Down To Earth report had stated that in nine out of past 15 years, about 100 districts of the country witnessed a drought like-situation, triggered by failure of south-west monsoon. During the period November 2013–April 2014, extreme drought conditions were recorded over an area extending from the Mediterranean coastal Middle East, northward through Turkey and eastward through Kazakhstan, Uzbekistan and Kyrgyzstan. 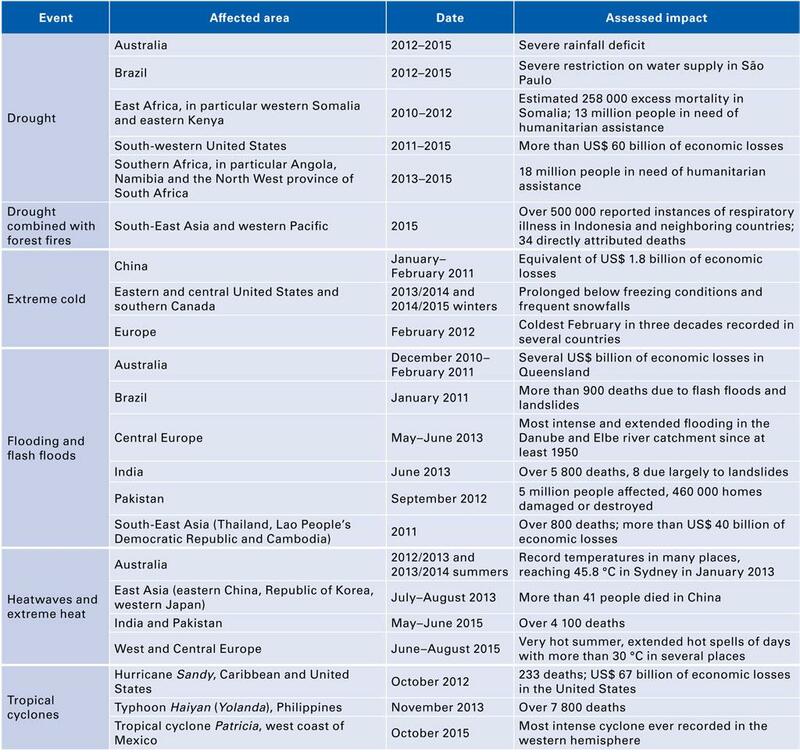 Destructive flooding in many parts of the world contributed to major casualties and heavy economic losses. India and Pakistan were particularly affected, with destructive flooding occurring in one or both countries in each monsoon season from 2011 to 2014. The most destructive single event occurred in June 2013, when very heavy rain in the far north of India, particularly in Uttarakhand state, was a major contributor to a series of events that resulted in more than 5,800 deaths. Four-day rainfalls over the most severely affected region were unprecedented, and the wettest day (16 June) had one-day rainfall 105% higher than that of any previous June day. Many of the deaths occurred in landslides. Destructive flooding also occurred in Kashmir and downstream areas in both India and Pakistan in September 2014. Pakistan also experienced significant flooding in both 2011 and 2012. 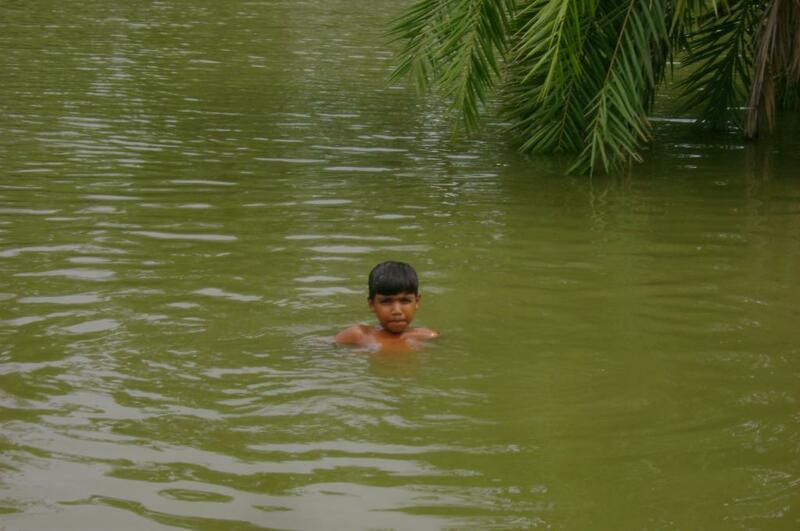 In September 2012, about five million people were affected and 460,000 homes were damaged or destroyed due to flooding. Flash floods led to significant casualties in many parts of the world during the period 2011–2015. The worst single event occurred in January 2011, when more than 900 lives were lost in a flash flood north of Rio de Janeiro, Brazil. The Philippines recorded several devastating cyclones in this period. While the largest economic loss from a meteorological event in the period happened due to Hurricane Sandy in 2012. The Typhoon Haiyan (Yolanda), which made landfall on the east coast of the Philippines in November 2013 caused the highest human casualty with 7,800 deaths. 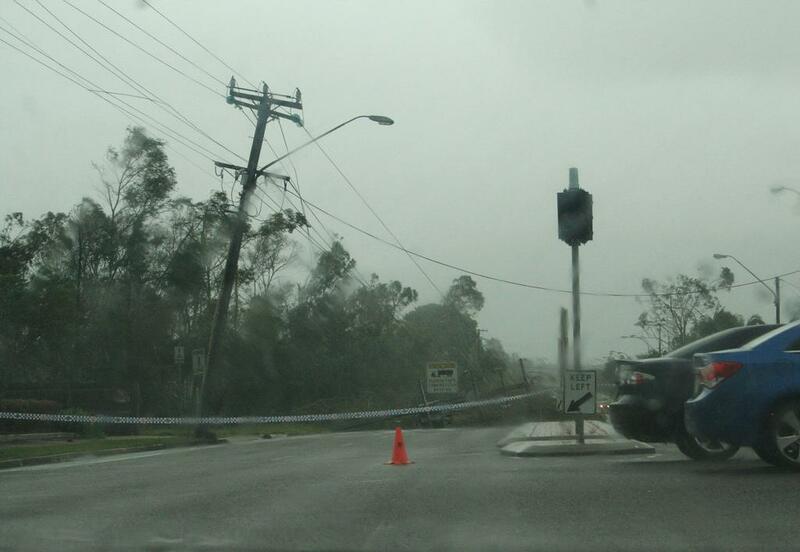 It was one of the strongest storms ever to make landfall anywhere in the world. The US experienced one of its most active tornado seasons (third-highest on record) in 2011. At least six tornadoes were assessed as category 5 on the Enhanced Fujita (EF) scale. In 2013, three very severe cyclones—Phailin, Helen and now Lehar— struck India within a span of two months. It raised a question as to what is the cause of higher frequency and greater intensity of the cyclones in the Bay of Bengal. These events not only caused huge loss of lives, livestock and household assets but also added to the problem of salinisation of agricultural fields, making them unsuitable for growing crops. Overall, global tropical cyclone activity was above normal in 2013 (94 cyclones) and 2015 (91 cyclones).